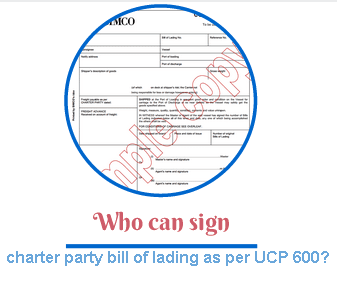 Who can sign a charter party bill of lading as per UCP 600? Letter of credit rules give special attention to transport documents. If you read the latest version of letter of credit rules, UCP 600, you will realize that all transport documents have been specified in very detail. UCP 600 rules define by whom each transport document must be signed in order be acceptable under letter of credit transactions. For example UCP 600 article 20 states that a bill of lading, however named, must appear to indicate the name of the carrier and be signed by the carrier or a named agent for or on behalf of the carrier, or the master or a named agent for or on behalf of the master. Today I would like to explain by whom a charter party bill of lading should be signed as per UCP 600? Is it possible to submit a charter party bill of lading instead of a marine bill of lading under a letter of credit payment? Letter of credit rules define different types of bills of lading. Multimodal bill of lading, marine bill of lading, non-negotiable bill of lading and charter party bill of lading are different types of bills of lading, which have been defined by UCP 600. Please keep in mind that UCP 600 is the latest and current version of L/C rules. Exporters and importers as well as bank personnel should understand the details of letter of credit rules very well, otherwise they make costly mistakes. Today I would like to explain whether a charter party bill of lading can be presented instead of a marine bill of lading under letter of credit transactions. Containerized cargo shipping and dry bulk cargo shipping. Containerized shipping deals with relatively small scale cargo shipments. Electronic goods, processed packed foods, textiles, mobile phones, furniture and almost every manufactured products are examples of typical goods that can be carried by container vessels. Shippers of the containerized cargo receive ocean bills of lading as a transport document from the container vessel carriers. Bulk shipping deals with huge cargo shipments. Coal, sugar, timber, copper, iron ore, chemicals are the main examples of goods that can be carried by bulk vessels. Shippers of the bulk cargo receive charter party bills of lading as a transport document from the owners or charterers of the break bulk vessels. 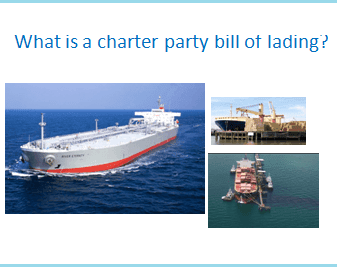 Today I would like to explain the core elements of a charter party bill of lading. You have to be very carefull when completing the consignee field of a bill of lading, because it does not only define to whom the goods should be delivered, but also explains delivery procedures of the consignment. If the bill of lading issued in a negotiable form, to order (shipper) or to the order of a named party, at least one original bill of lading must be surrendered to the carrier's agent at the port of discharge in order to get the consignment. But what happens if a bill of lading not issued in negotiable form by simply completing the consignee field writing direct consignee's name and address. 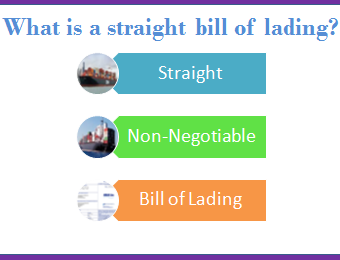 On this article I will be explaining the straight bill of lading, which is a type of bill of lading that is issued in a non-negotiable form. According to Incoterms 2010 FOB, CFR, CIF trade terms rules, the seller is required either to deliver the goods on board the vessel or to procure goods already so delivered for shipment. The reference to “procure” here caters for multiple sales down a chain (‘string sales’), particularly common in the commodity trades. Above definition explains seller's delivery obligation under FOB, CFR and CIF trade terms according to Incoterms 2010 rules. As mentioned on the 1st paragraph, incoterms rules allow multiple sales or string sales. But what sort of bill of lading the seller (exporter) should supply to his buyer, which becomes the new seller and trades the same goods to another potential buyer with the same bill of lading? What is the function of a "to order" bill of lading? 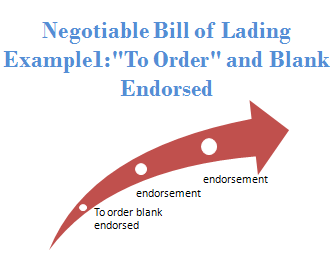 On my previous article I have explained the differences between a negotiable bill of lading and a non-negotiable bill of lading. I have also described the importance of negotiable bill of lading in international trade on the same article. I strongly recommend you to see my previous article titled with "How to complete consignee and notify fields of a bill of lading?" before reading this page in order to better understand today's post. 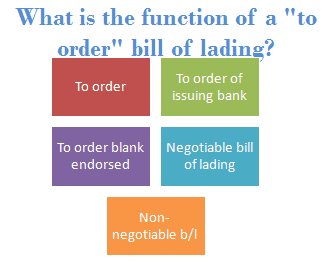 Today I want to explain the function of a "to order" bill of lading in foreign trade businesses. How to complete consignee and notify fields of a bill of lading? Today on this post, I will be explaining with examples one of the key elements of a bill of lading in international trade. 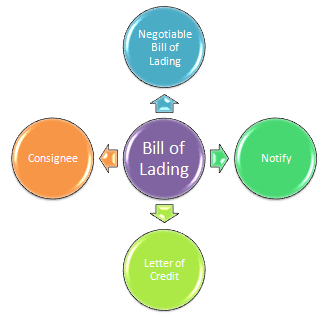 Bill of lading is a negotiable transport document, only when it is issued in a negotiable form. Negotiable bill of lading plays a key role in international export-import transactions, where the exporter or exporter's bank does not want to release the goods to the importer without surrendering at least one original bill of lading to the carrier's agent at the port of discharge. What is a negotiable transport document? What are the differences between negotiable bill of lading and non-negotiable bill of lading? How does a bill of lading could be issued in a negotiable form? What is a consignee field on the bill of lading? What is a notify field on the bill of lading? Bill of lading, which is a transport document evidences receipt of cargo, contract of carriage and represents title of goods, is mostly used in international port-to-port sea shipments. 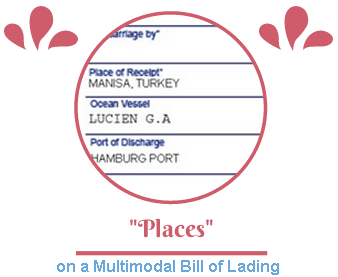 A bill of lading should normally state the port of loading and port of discharge. Port of loading is the place where the goods are shipped on board a vessel. Port of discharge is the place where the vessel is off-loaded and the goods are distributed to their respective consignees. Some bills of lading contain "cy/cy" term in addition to port of loading and port of discharge. 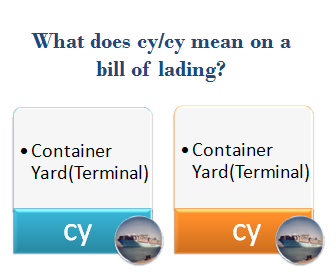 Today I would like to explain the meaning of "cy/cy" term as seen on the bills of lading. Are chargeable weight and volumetric weight the same? On my previous article I have explained how to calculate chargeable weight not only in air shipments but also sea and road shipments as well. 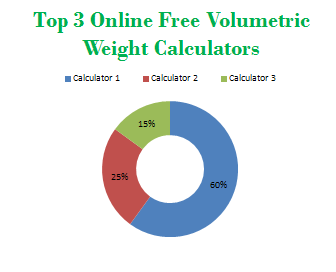 When I was writing my article I have read couple of websites, who mentioned that chargeable weight and volumetric weight as if they are the same concepts. Unfortunately it is not true. 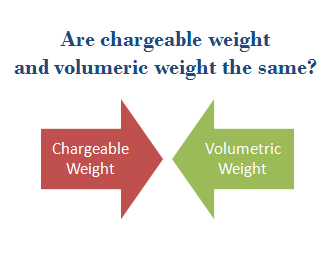 Chargeable weight and volumetric weight (also known as dimensional weight) are not the same concepts. As an exporter or an importer you have to know the gross weight and total volume of the cargo in order to calculate the transportation cost. In order to sell their free spaces more efficiently, international logistics sector developed a concept, which is known as chargeable weight. According to this concept, first of all transport companies are calculating an hypothetical volumetric weight of the cargo to compare it with the actual gross weight of the goods. Then, they choose the bigger amount, either actual gross weight or hypothetical volumetric weight. Result is known as the chargeable weight. 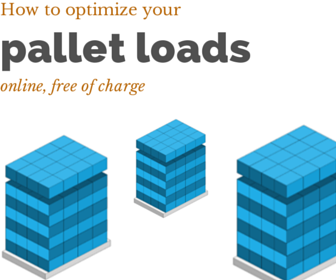 Only chargeable weight is used by international logistics companies, when calculating their freight offers. Today I would like to explain you how to complete the airport of departure field correctly according to letter of credit rules. Air waybill is a transport document that is used in air shipments, which will be requested by issuing banks under letter of credit transactions. Airport of departure is one of the key elements of an air waybill and it needs to be completed carefully when dealing with a letter of credit, because banks find discrepancies on the transport documents more frequently than any other shipping documents under letter of credit presentations. If you need more fundamental information in regards to airport of departure and how it functions on an air waybill, please have a look at my previous article "What does airport of departure and airport of destination mean on an air waybill?" All transport documents, which are used in foreign trade transactions, should state a starting and an ending point of the carriage. Otherwise the responsibility of the carrier cannot be defined under the contract of carriage. If you make a sea shipment, you will get a bill of lading from the transport company, who is either the agent of the carrier or a freight forwarder. The bill of lading should show port of loading and port of discharge as starting and ending point of the carriage. Similar to bill of lading, air waybill states airport of departure and airport of destination as starting and ending point of the carriage. Today I would like to explain definitions of airport of departure and airport of destination as stated on the air waybill transport document. 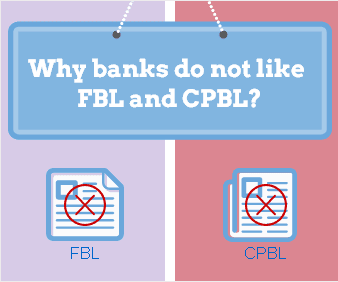 Can an air waybill be issued to order of an issuing bank? Transport documents are one of the most important document types in international trade business. They not only evidence receipt of cargo but also contract of carriage as well. Additionally some transport documents title to cargo such as negotiable bills of lading. Unlike bill of lading, air waybill is not a negotiable transport document, as a result it cannot be issued in negotiable form, which means that air waybill cannot be issued "to order of the issuing bank". Today I want to explain what does negotiable transport document mean in export and import business and why an air waybill cannot be issued "to order of the issuing bank".